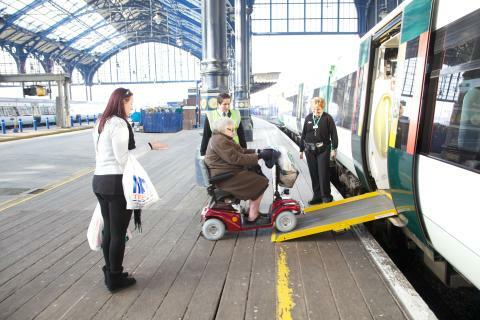 Monday 3 December 2018: Govia Thameslink Railway (GTR) is on track to deliver a raft of upgrades across the network by March 2019 through its stations accessibility fund to improve access for all passengers, marking the commitment on International Day of Persons with Disabilities. As part of the rail operator’s ‘Minor Works’ fund – an annual fund which the organisation dedicates to enhance stations with physical improvements to make stations more accessible – passengers across the network will benefit from upgrades including step-free access, ramps, accessible toilets and double-height handrails. Ahead of the completion of these projects to improve station accessibility, 78% of GTR stations currently have some form of step-free access, with 58% of stations fully step-free. International Day of Persons with Disabilities is a day of observance promoted by the United Nations to increase understanding, public awareness and acceptance of people with disabilities and celebrate their achievements. The theme for 2018 is ‘Empowering persons with disabilities and ensuring inclusiveness and equality’. As part of the Thameslink Programme, platform humps have been added to stations between London Bridge and St Pancras giving level access to the train for easier alighting and embarking from services for passengers using wheelchairs and scooters. Gatwick Airport Station and Gatwick Airport were recently highly commended under the Project of the Year award at the Global Air Rail Alliance Awards for becoming the UK's most accessible airport. GTR has also recently updated its safety guidance for people using wheelchairs and mobility scooters across the network to better support this group of passengers. 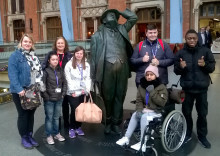 Other initiatives are available for people with additional needs, including the popular ‘Try a Train’ trips which take groups out on the network to increase their confidence when travelling independently by train. Kelvin Lindsay, Community Skills Project Manager at specialist support provider, County Care, said: “We have been working with GTR for a number of years, offering support and guidance on accessibility improvements for passengers that need additional support. 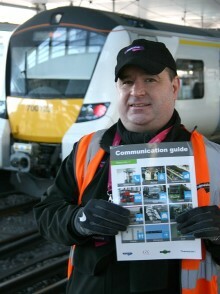 As well as physical changes to stations, the addition of the communication guides have had a huge impact; it gives people with disabilities or those who may need extra support the confidence to ask for help without having to explain their needs every time they travel, meaning that many are not afraid to travel by train anymore – it has given them real independence. 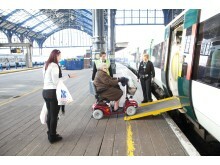 Govia Thameslink Railway works closely with its Access Advisory Panel (AAP) and other stakeholders for advice on policy and support for disabled passengers and when considering upgrades to stations, new directives and guides for travel support, to ensure that the projects maximise accessibility of our stations, as well as taking on suggestions from the AAP to implement. Earlier this year, working with the panel, GTR released a series of communication and travel support documents to make it easier for people travelling on the network that have additional needs. Available at stations across the network, the Travel Support Card is for passengers to show to rail staff which features a “How you can help me” space to explain the support they need, and further spaces for journey details and emergency contacts. The Accessibility Communication Guide is a pictorial guide that makes it easier for GTR customer service staff and passengers to communicate. GTR also issues Priority Seating cards and ‘Baby on Board’ badges to help the passengers most in need to secure a seat. These are available from each GTR website. 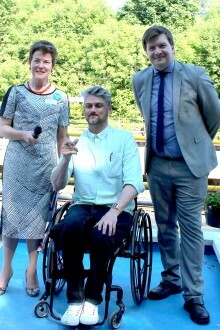 Over 100 residents gathered at Hadley Wood railway station on Friday (26 May) to celebrate the opening of a new access ramp funded and built by Great Northern in response to a community petition. Govia Thameslink Railway (GTR) is introducing sets of innovative rail travel access aids to support passengers who need help with communication, such as those who are hard of hearing or have language or learning difficulties.